Join us for unique, behind-the-scenes opportunities to explore the Greenway. We have selected some of the most iconic (and scenic!) stretches in the Greenway and created special trips that allow you to experience some of the treasures of our region. June 15, 2019 | Upper Yakima Float Trip | New Trip! Explore the eastern part of the Greenway—from the river! Join us for a special float trip along the Yakima River, floating the Upper Canyon between Cle Elum and Thorp. Raft past basalt canyons, rolling forests, and green farmlands of the Yakima Basin with expert guides, and learn about this basin’s unique ecology and efforts to conserve it from special guest speakers during our locally sourced lunch. Registration opens soon. Our popular bike trip is back! Discover this incredible 2-mile long tunnel at Snoqualmie Pass – a remnant of our railroad history. The biking trip will take you through the tunnel’s cool darkness onto a 20-mile stretch of the Palouse to Cascade State Park Trail, providing sweeping views of the Cascades and then a lunch back at Rattlesnake Lake. Registration opens soon. Explore the Greenway Trips highlight the rich history, ecology, and recreational opportunities in the Mountains to Sound Greenway. All trips blend outdoor trips and on-the-ground education with an incredible opportunity to meet and hike/bike alongside other Greenway residents and passionate supporters of this region. 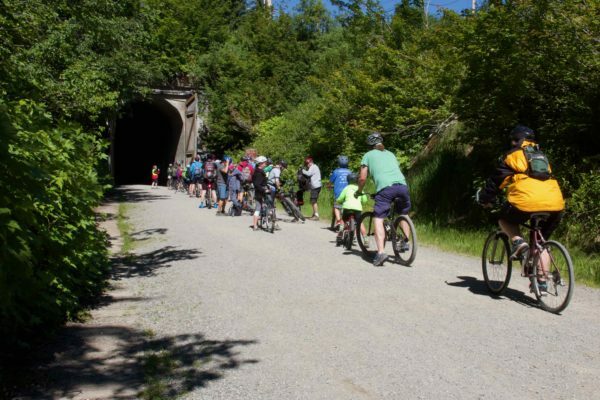 The Greenway Trust handles all the logistics for these trips, including shuttle service from your car to the start of the hike or bike, educational opportunities along the way, route map, food, and t-shirt.